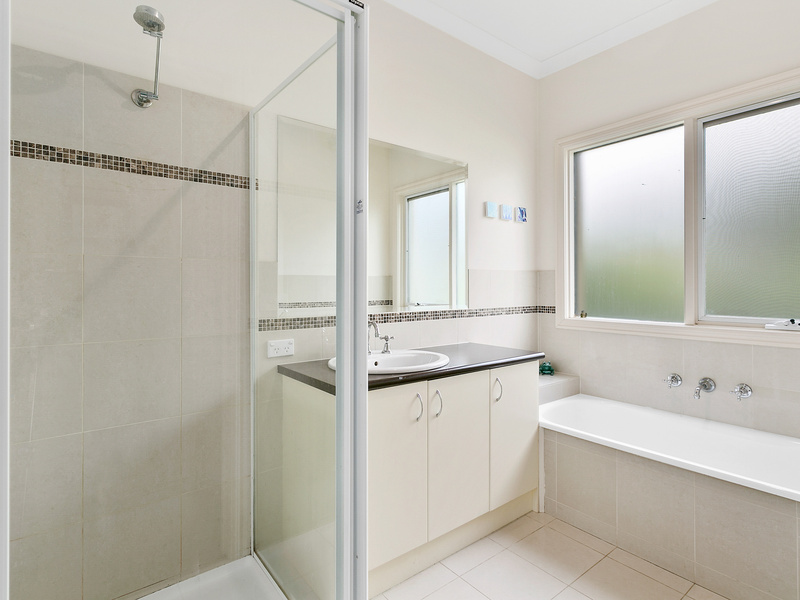 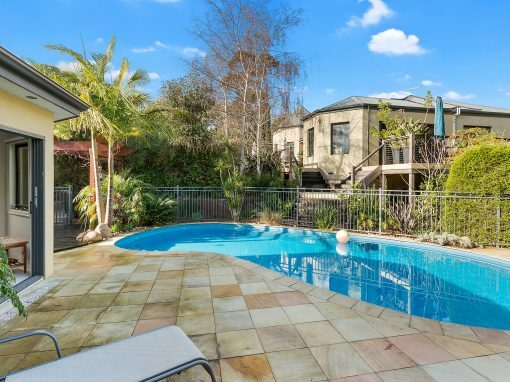 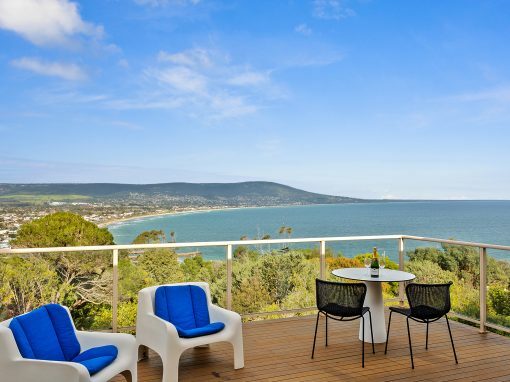 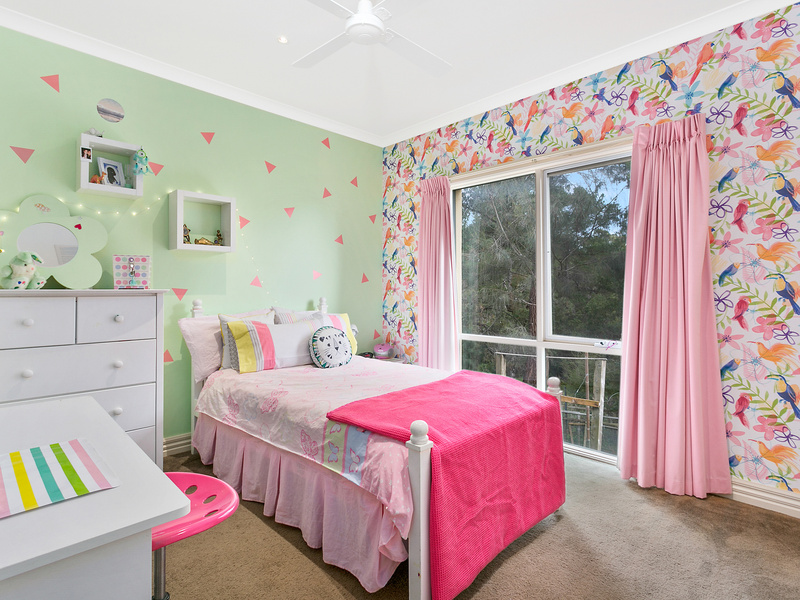 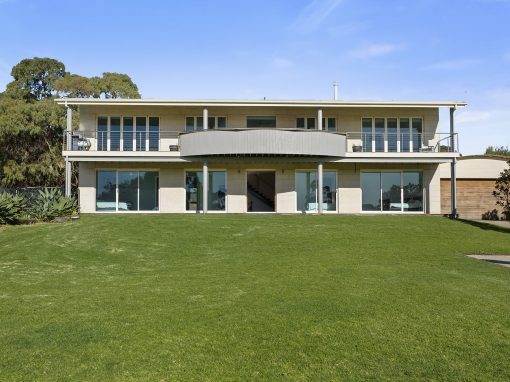 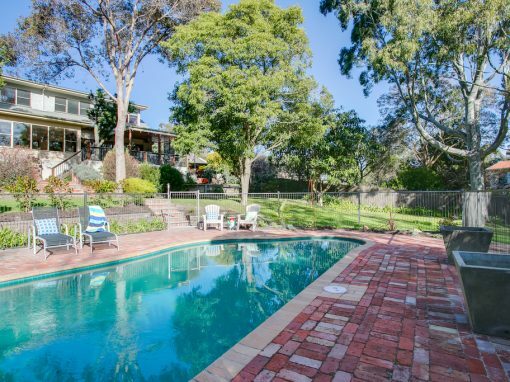 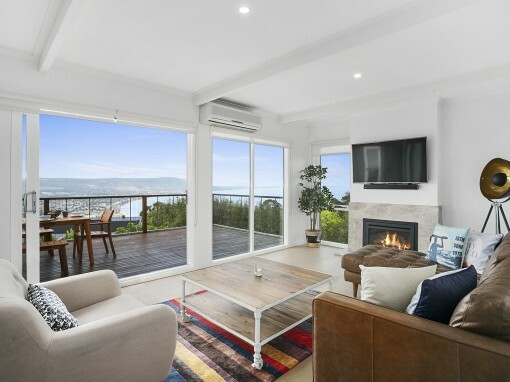 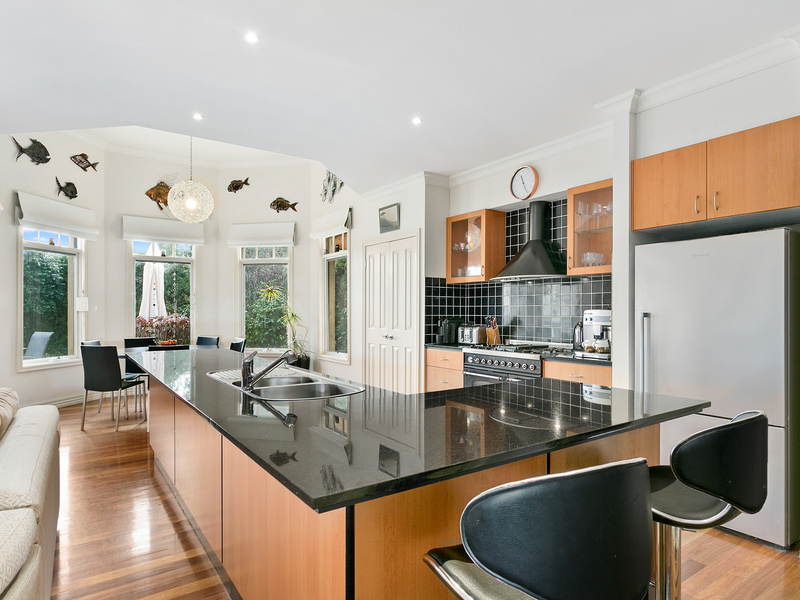 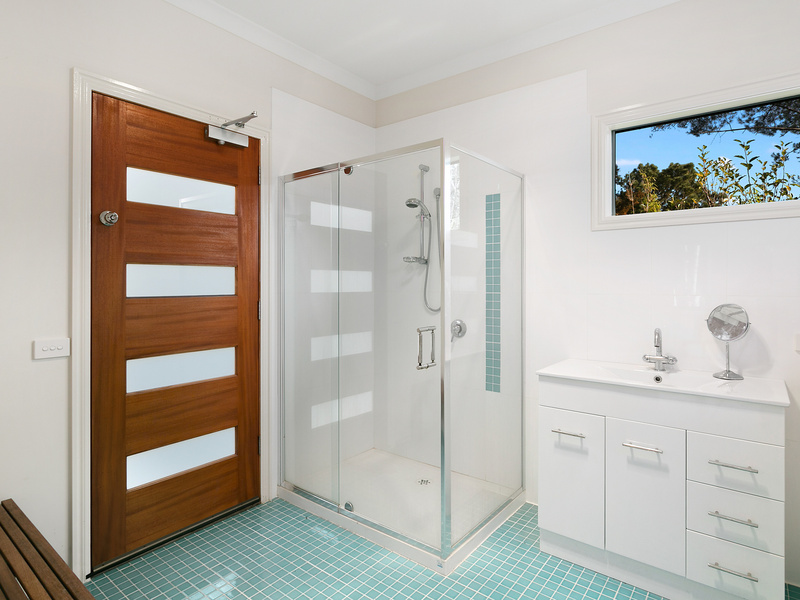 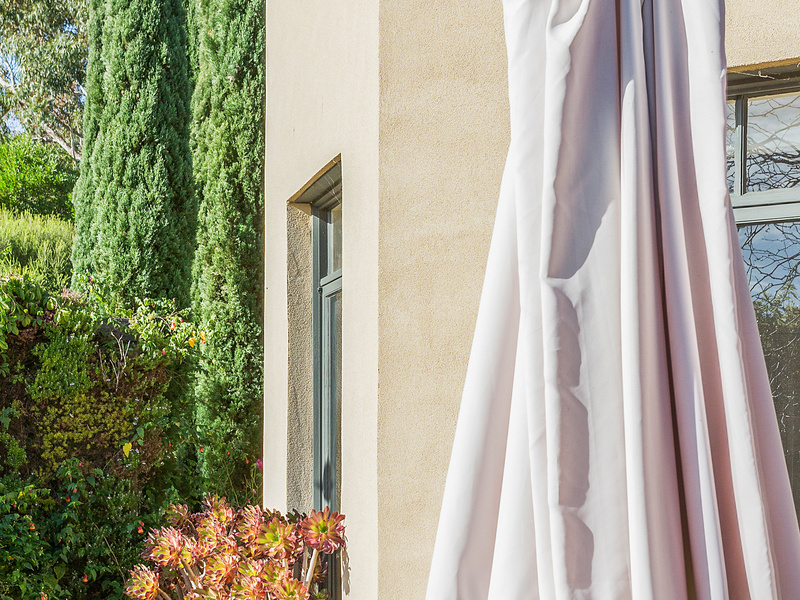 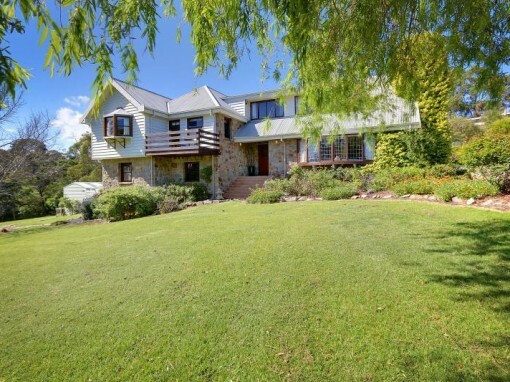 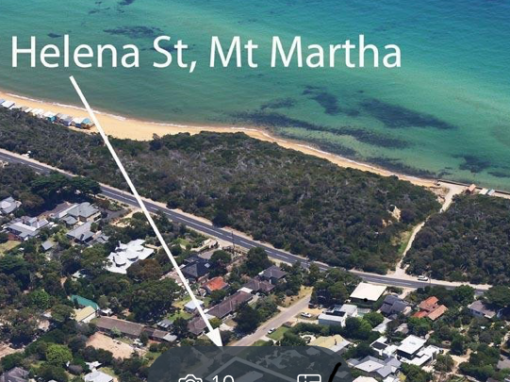 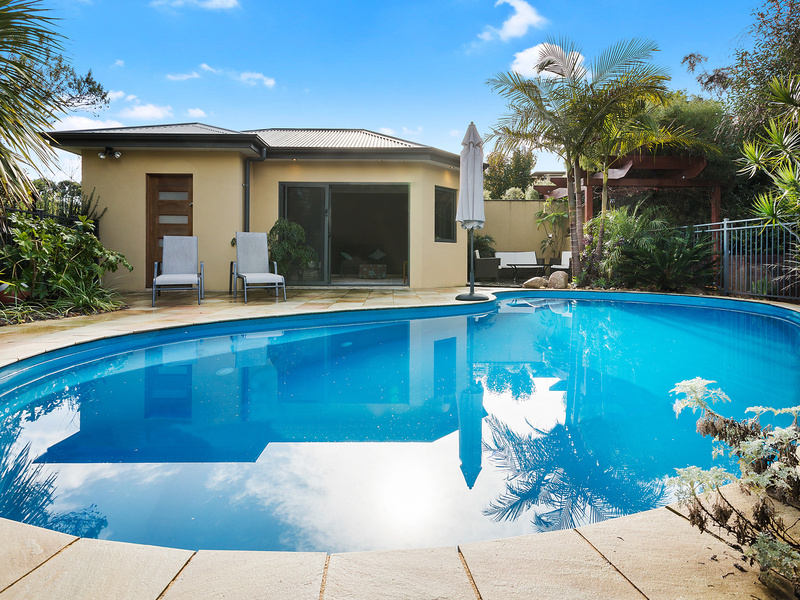 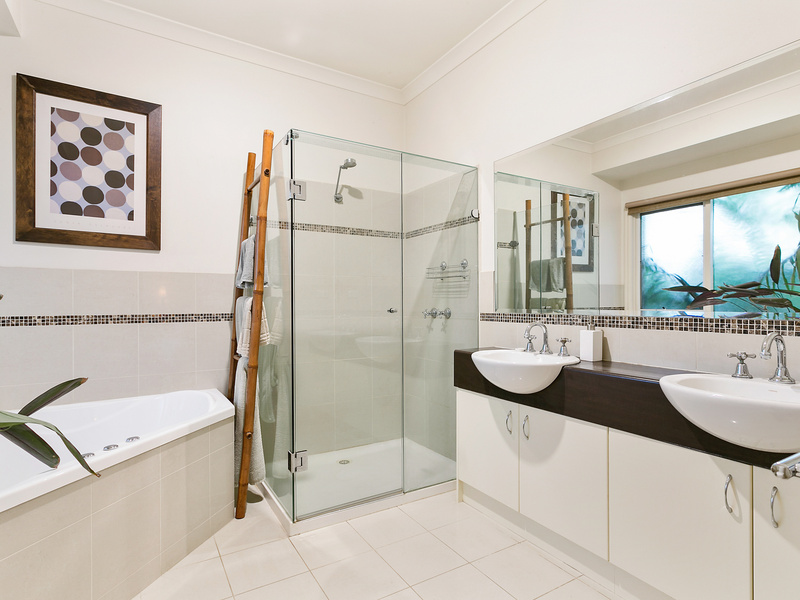 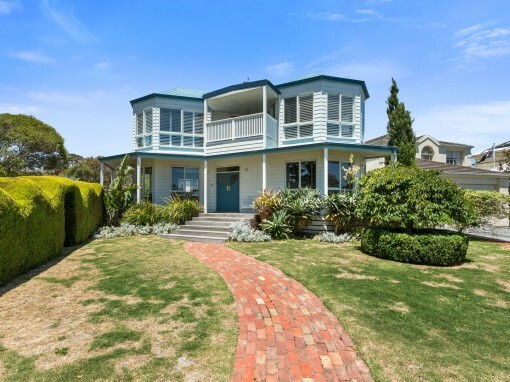 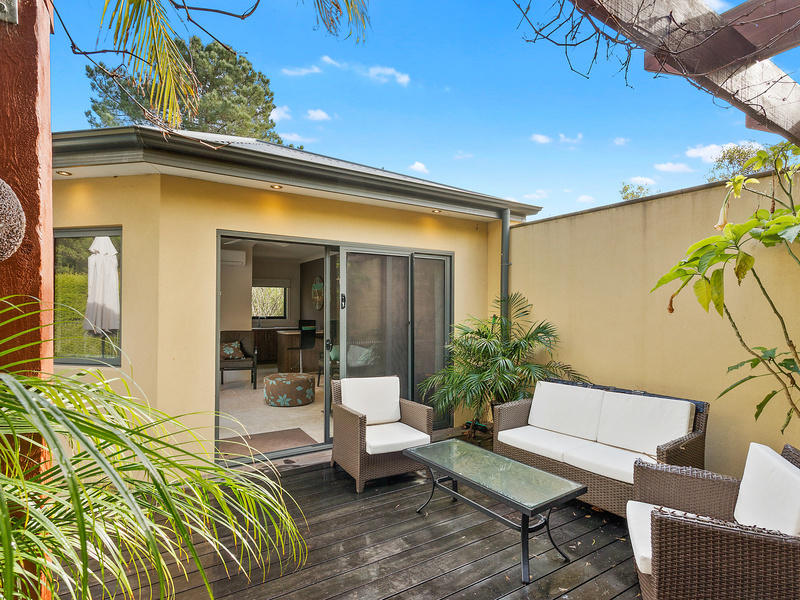 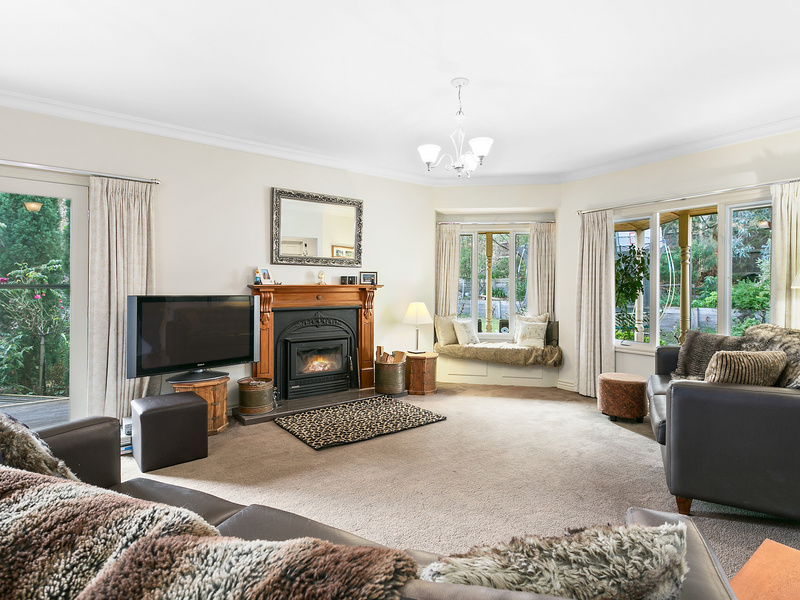 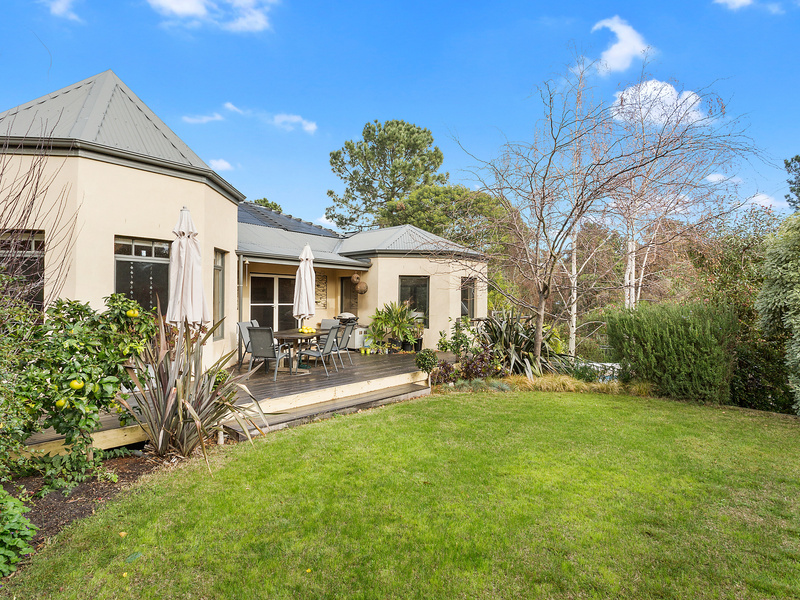 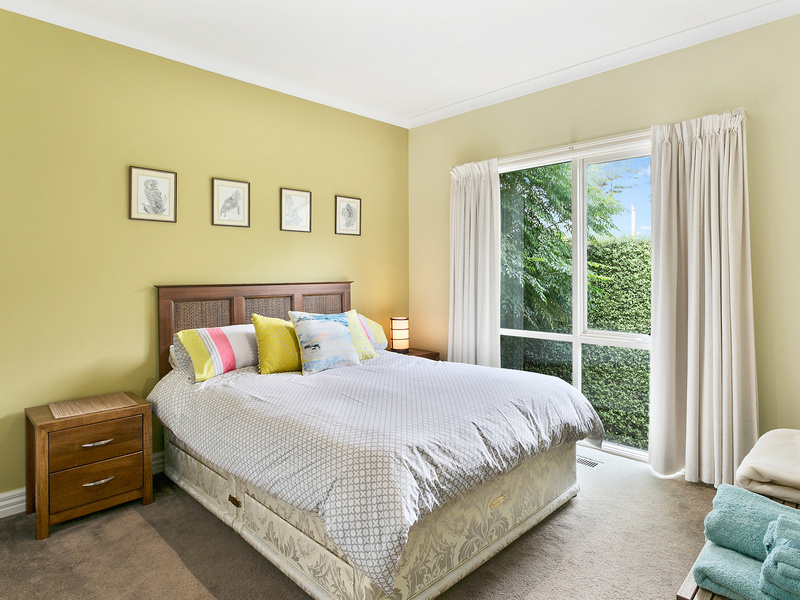 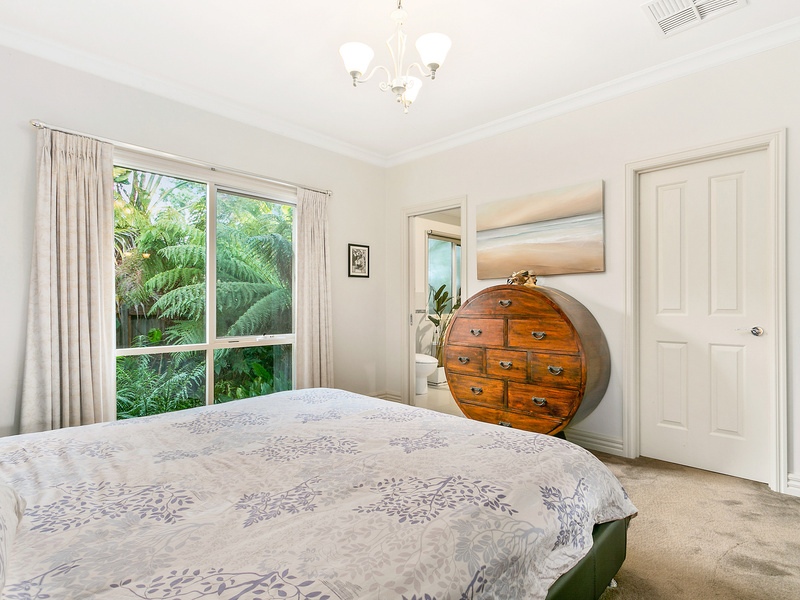 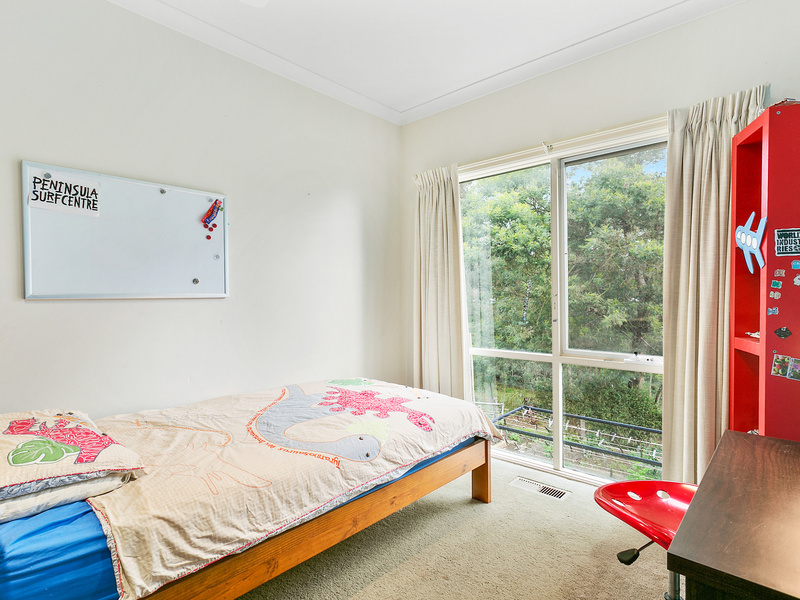 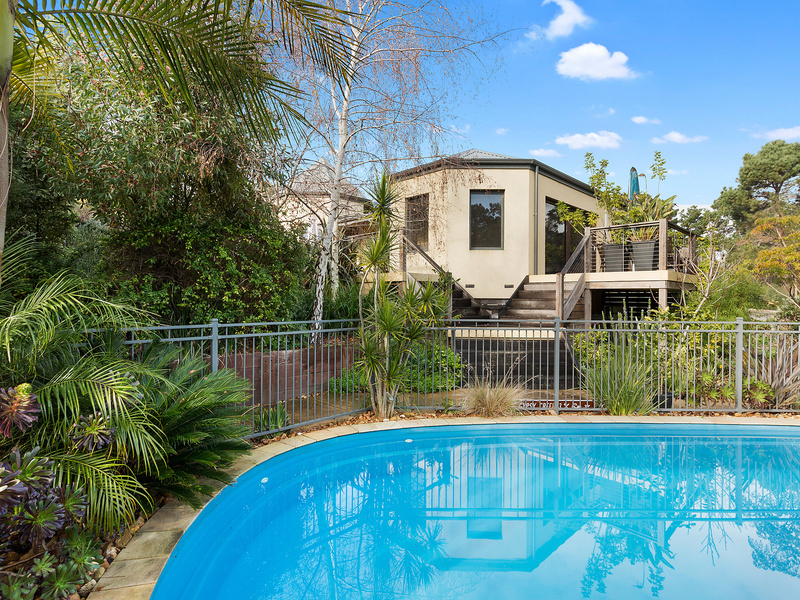 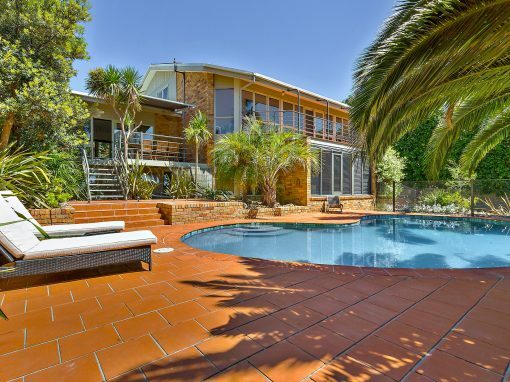 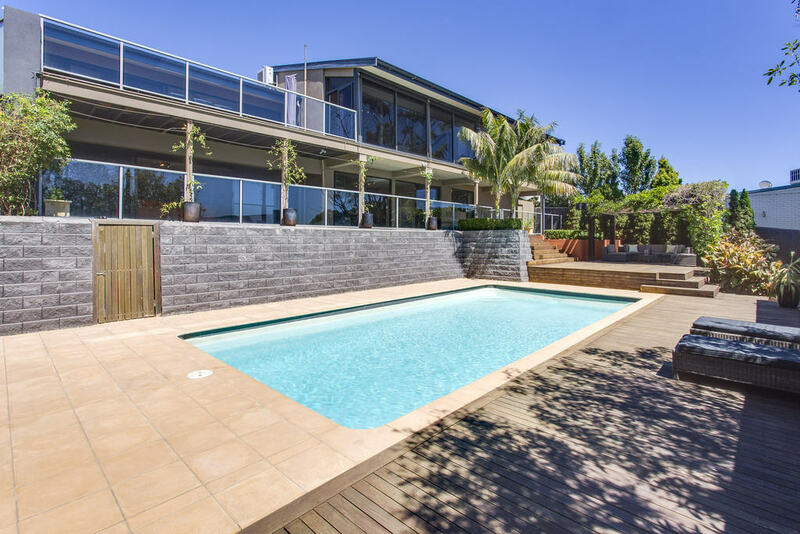 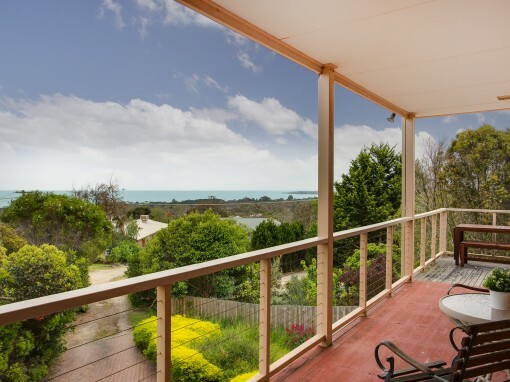 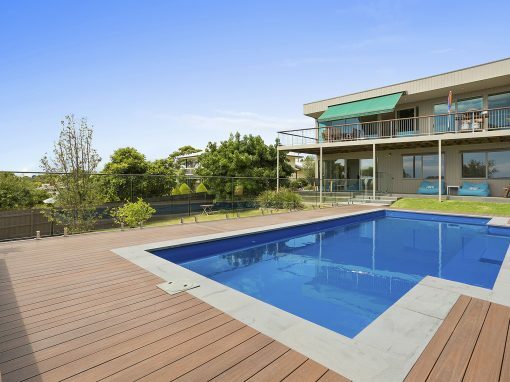 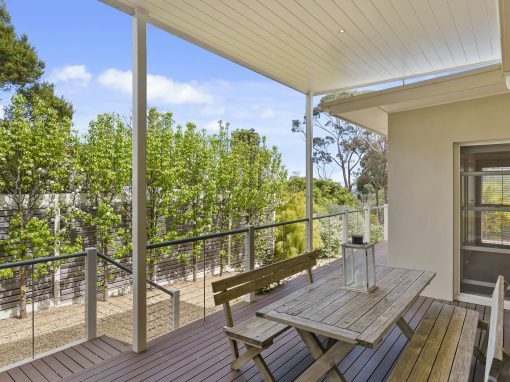 4 Bedroom House (sleeps 8) with Separate Pool Studio, close to South Beach Mt Martha. 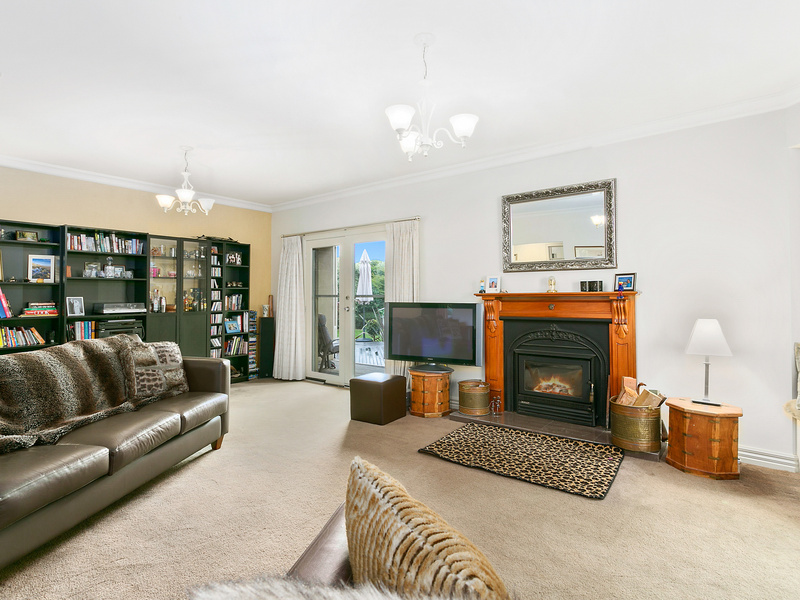 Through the entrance of this house is the Lounge room with Plasma Tv and Dvd, Leather Couches, Fireplace, Sound system and Bookcases. 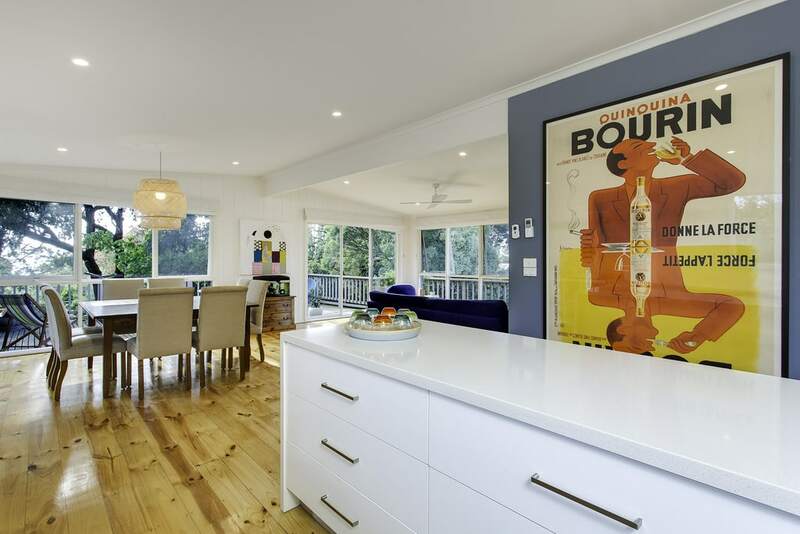 There is an open plan Kitchen/Dining/Living area. 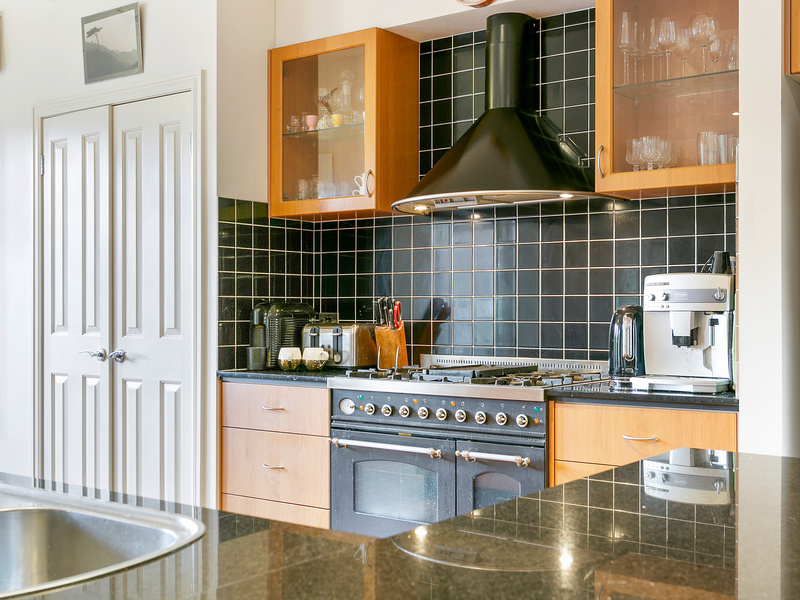 Kitchen has modern appliances including Coffee machine. 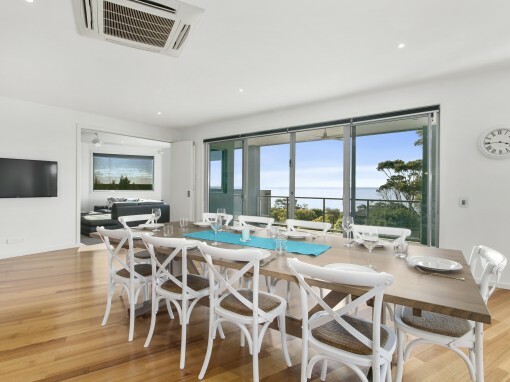 Dining table seats up 8 people. 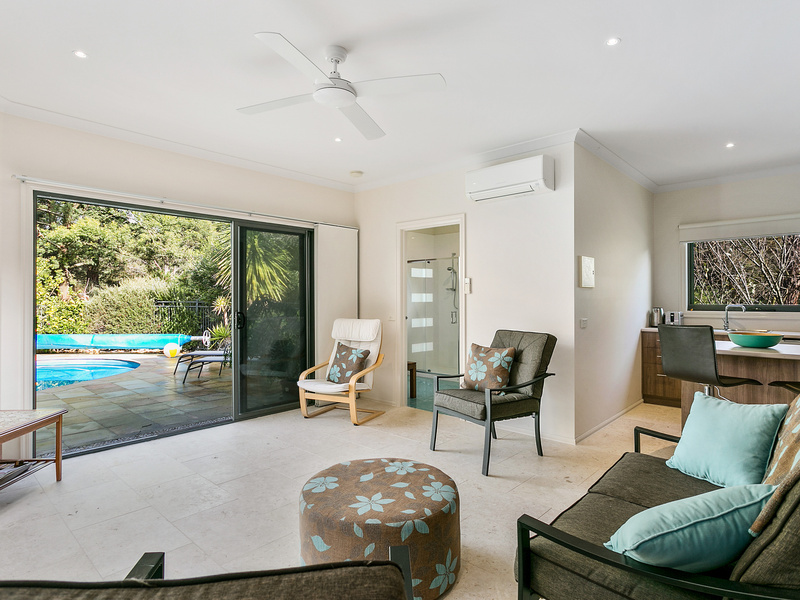 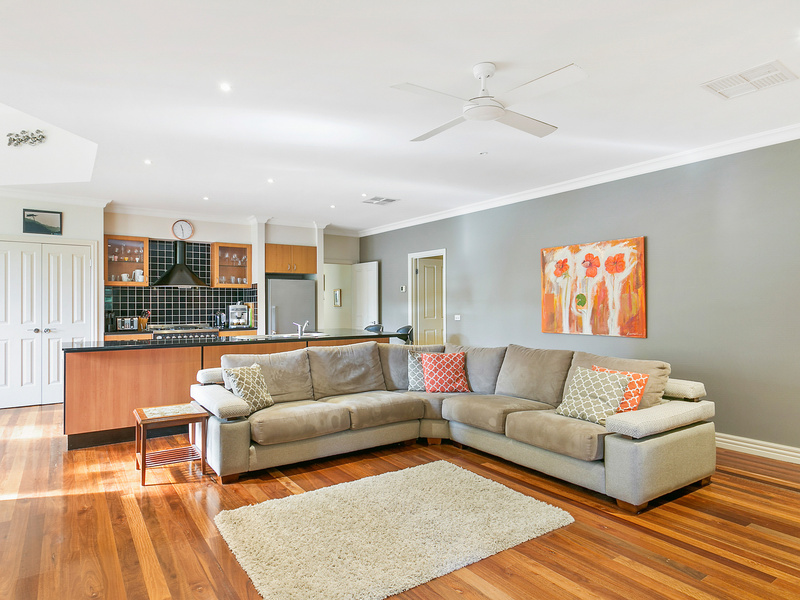 The Living area has a large flat screen LCD, with Smart Tv and fan. 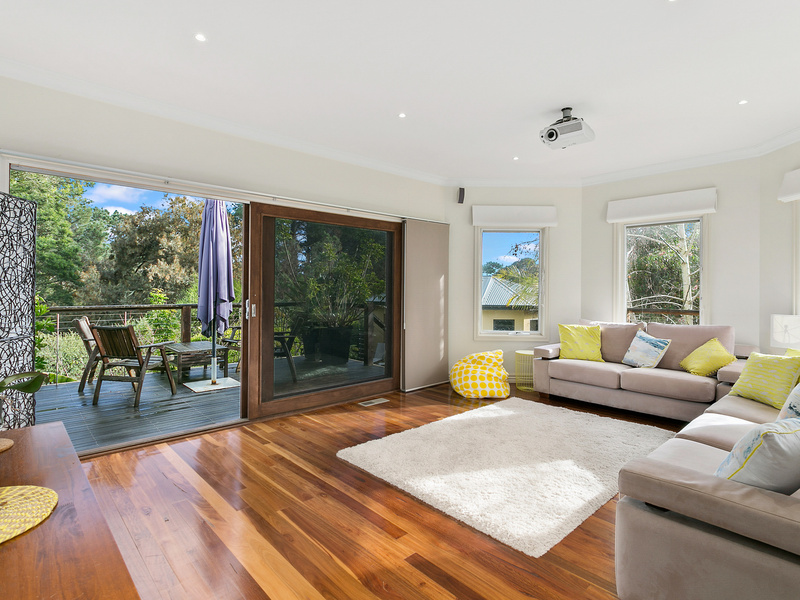 There is a second Living area which doubles as a Theatre with projector that plays Dvds – there is a Dvd library available. 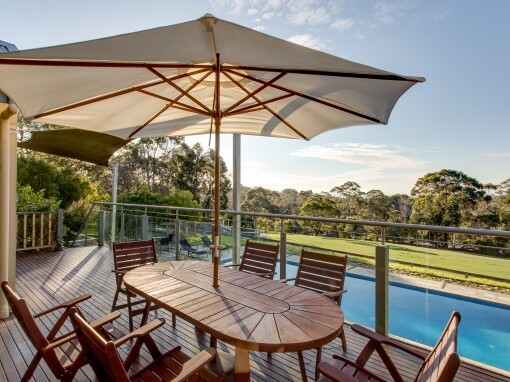 This area opens onto a deck facing a large green nature reserve. 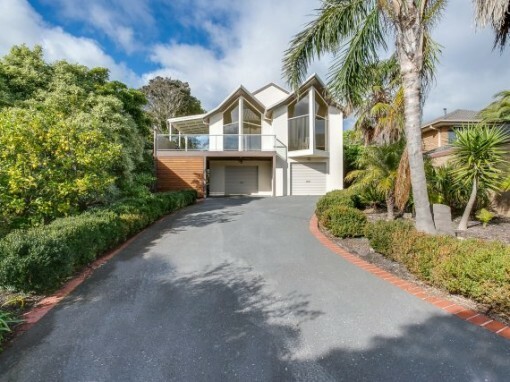 The entrance to the property has OSP for up to 4 cars – there are 2 driveways , so it would be possible to park a boat and trailer. 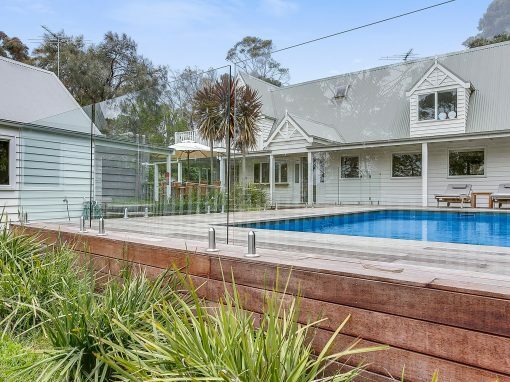 The front yard has a trampoline, basketball ring and lawn. 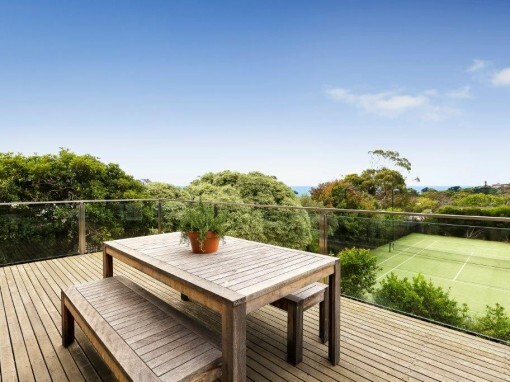 Around the side of the property is a sunken garden and an outdoor deck with Webber BBQ. 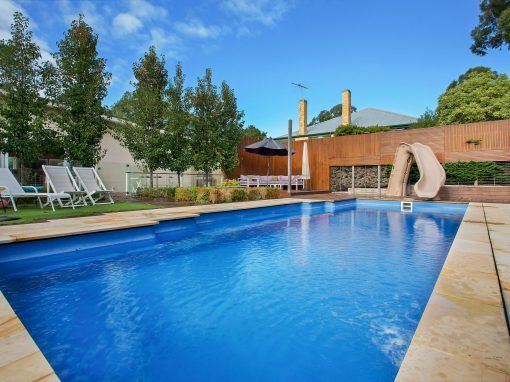 At the rear of the property is an inground heated (solar) swimming pool with separate Studio. 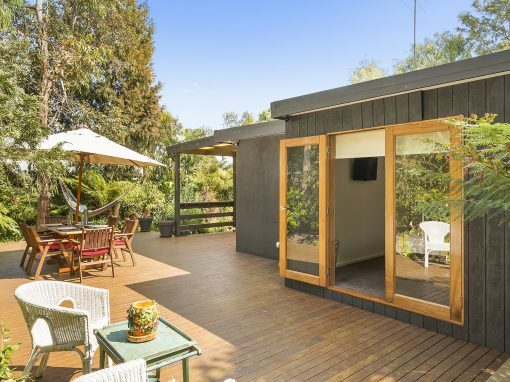 Pool House (Studio) has a Table Tennis table, kitchenette, fridge, reverse cycle air conditioning, shower and toilet and the safety of self closing doors. 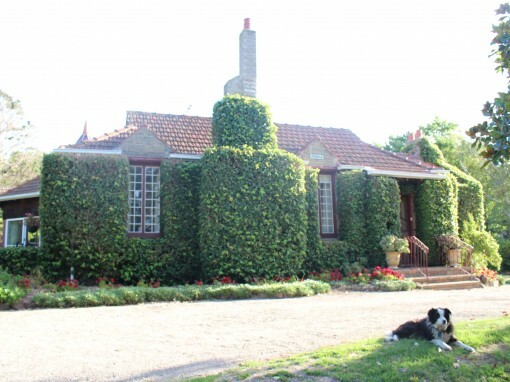 Pets (Cats only) may be permitted with prior consent from owners.